Do you read Tricycle? You really should. 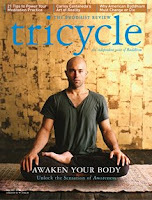 Tricycle calls itself "the independent voice of Buddhism," and though its online content is fairly limited unless you're a subscriber, it's worth a few minutes' browsing if you've got them. I can get lost in the archives pretty easily - although it's definitely a good kind of "lost." Phillip Moffitt has a short piece on the types of desire. I'm doing a lot of syncretic work right now comparing Buddhist and Christian notions of desire, and this is killer. A good peek at what can be an overwhelming dive into various types of Buddhist sensibilities. I'm quickly learning that just as "Christian" can simultaneously mean scary pscyho anti-body conservatives or social justice-oriented pacifists, so too is it dangerous to clump "Buddhists" into one big lump. Many stances, many ways. "Pablo Neruda, toward the end of his life, was invited to read in Caracas. He read for quite a long time before a large crowd. Then he asked, “Is there anything else you’d like to hear?” Someone raised a hand and asked, “Would you please read Poem 19 from Twenty Love Poems and a Song of Despair?” Neruda answered, “Oh, I’m sorry, I didn’t bring that with me,” at which four hundred people rose to their feet to recite the poem. What a culture that is, to have the poet’s voice in the hearts of so many people."